Hello and Welcome to Silvercraigs Caravan Park, the year round caravan & camping park. 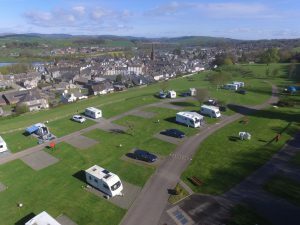 Situated on the edge and overlooking the Artist’s town of Kirkcudbright, Silvercraigs Caravan Park is only two minutes walk from many shops, cafes, bars and tourist attractions. There is a well equipped public playpark adjoining the caravan site and lovely walks behind the park in the Barrhill woods. We are open all year round with staff on site during the day from April to October, if you arrive anytime from November to March call the number on the barrier and someone will let you in, this also applies to late arrivals during the summer season. We are very dog friendly and have no limit on numbers, as long as they are on a lead in the park and any mess cleaned up.